Blade of Night "Draw out and defeat Ecthar, Sword of Oryx, in the Asylum on the Dreadnaught." Objectives: Kill Ecthar, Sword of Oryx In The Founts on the Dreadnaught, there are three major Knights near the door to The Asylum.... New Deathveil wrote: *The Admiral of the NDSC Hyper-Class Dreadnaught "Droko" (The largest Dreadnaught to appear so far) responds* "You are now transmitting to the Fleet of New Deathveil. Destiny: The Taken King was released earlier this week. Sometimes we include links to online retail stores. If you click on one and make a purchase we may receive a small commission.... yes. you first get the blank rune, then you use it to summon the yellow ogre dude in the hull breach. that ogre drops another "wormfeeder rune" (or something of a similar name) that tasks you with 50 kills without dying on the dreadnaught. when you finish the 50 kills, you get a key. There are 50 Calcified Fragments on Dreadnaught Areas in Destiny. Currently are only 46 discoveres, these 46 fragments see you in this Video. You need 45 fragments for the exotic scout rifle Touch of Malice, also you need 5 fragments for a Eris morn quest which is activated if you found one fragment and go to Eris Morn. There is no option to see ingame which fragment you have and which not... The motes are easy enough to find in Destiny classic, but players will need to head to Dreadnaught for the Hadium Flakes via the Level 35 Patrol. Players will spawn in the Hull Breach , from there head forward to the middle of the area in front of you. Task: Draw out and defeat Ecthar, Sword of Oryx, in the Asylum on the Dreadnaught. 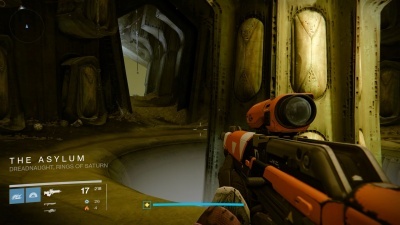 Quote : "Nightstalker scouts aboard the Dreadnaught place Ecthar, Sword of Oryx, in the ship's Asylum. We'll need to defeat him to finish purifying your sword." Draw out and defeat Ecthar, Sword of Oryx, in the Asylum on the Dreadnaught. "Nightstalker scouts aboard the Dreadnaught place Ecthar, Sword of Oryx, in the ship's Asylum.